After the whole Maggi controversy, it should come as no surprise to us that MSG is a big part of foods we eat almost every day. For instance, crackers, canned soups, salad dressings, processed meats, and frozen dinner contain MSG that makes packaged and/or stored foods smell fresher and taste better. 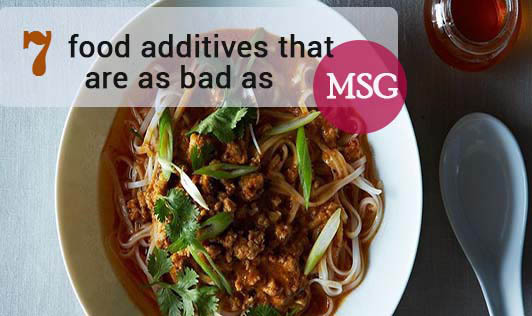 Food for thought- there are other additives that are as bad as MSG for your system. To know about them, read on. Artificial Sweeteners - Aspartame, sold in the market under the brand name as Nutrasweet and Equal is commonly present in foods labeled as "diet" or "sugar-free". Aspartame is carcinogenic in nature and is a neurotoxin that can affect intelligence and memory. Persistent use of this toxic sweetner may also cause emotional disorders like anxiety attacks, depression, nausea, dizziness, headache, migraine, mental confusion, and seizures. Furthermore, some other conditions like brain tumor, multiple sclerosis, lymphoma, fibromyalgia, and diabetes have also been associated with it. High Fructose Corn Syrup (HFCS) - This artificial sweetener is highly-refined and is the top-most source of calories in America. It is present in all sorts of processed foods like yogurt, granola bars, and cereals. HFCS increases LDL (bad cholesterol) levels, causes weight gain, tissue damage, and diabetes. Trans Fats - The chief role of trans fats is to elongate the shelf life of foods. It is formed by a process called hydrogenation and is used in junk food and certain processed foods. According to some studies, trans fats raises the levels of bad cholesterol, increases the risk of stroke, and other heart diseases. Artificial Food Colorings - Artificial colorings are used in fruit juices, soda, cupcakes, and salad dressings. This additive leads to behavioral problems in children and also affects IQ level. Furthermore, it may increase the chances of kidney and adrenal tumors, thyroid cancer, and chromosome decline. Sodium Sulfite - This preservative is widely used in making wine and some other processed foods. Some people, especially the asthmatic are sensitive to sulfite. They may experience breathing problems, headache and rashes. Consumption of sulfite may cause death by affecting the airway and resulting in cardiac arrest. BHA & BHT (E320) - Butylated hydroxyanisole (BHA) and butylated hydrozyttoluene (BHT) are used to preserve chewing gum, potato chips, cereals, and vegetable oils. This additive retains the flavor and color of the food. It doesn’t let the food become rancid. It majorly impacts the neurological system and alters behavior. These are oxidants which produce cancer-causing reactive compounds in the body. Sulfur Dioxide (E220) - Sulfur additives are toxic in nature, which is why they are banned in the USA by the FDA. The International Labour Organization also suggested that it should be avoided, especially if you have bronchitis, bronchial asthma, emphysema, conjunctivitis, or cardiovascular diseases. Children must not consume it at all. Sulfur dioxide is used in raw fruits, dried fruits, beer, soft drinks, juices, vinegar, wine, potato products, and raw vegetables. The additives mentioned above are the top 7. There are still a number of others which are as/ more harmful as/ than MSG. So, do check the ingredients list thoroughly and do your research whenever you go shopping for groceries or other packaged foods.